danger garden: Wednesday Vignette, who wore it better? Last week, on Halloween, Andrew appeared at the front door to "trick or treat" with the neighborhood kids. He got a beer and I got a trio of this colorful Gerbera Daisy, with it's mum-like center. 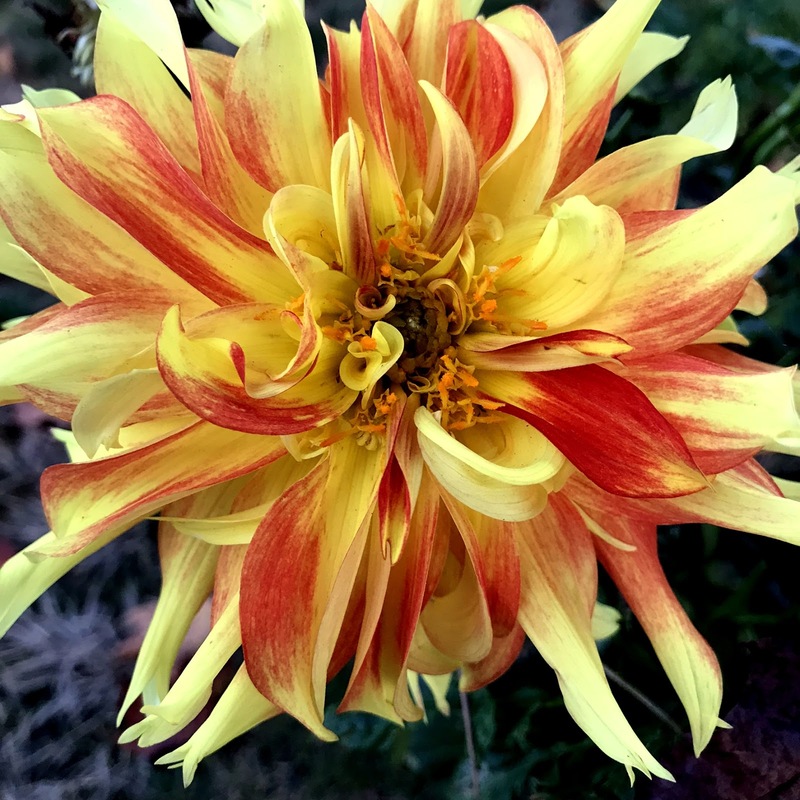 The next day I was walking Lila and discovered a Dahlia in a neighbors front garden. I've walked by this place dozens of times in the last month and never noticed the flowers. Of course the fist thing I thought was "that's the same exact color combo as my Gerberas!" So who wore it better? 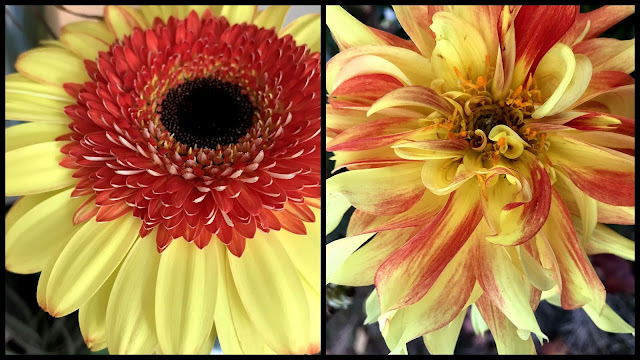 Gerbera, or Dahlia? I think they both wear it beautifully! 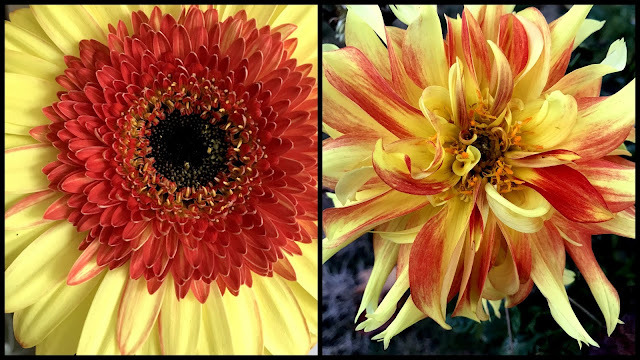 The Dahlia in a more disheveled, windblown kind of way, whereas the Gerbera has that impeccably styled look. Your husband btw, is a total sweetheart - what a nice idea! Yes indeed, I got a good one. What is fascinating to me is that they both look sort of fake. I like the solid color daisy better but it also looks like two flowers stuck together. Clearly I am slower to accept horticultural changes than in other areas. Yes definitely, especially the Gerbera, it's a clown flower! To me, there is no "better", just different. Sometimes I like Van Gogh, others Degas, depending on my mood. Are you a mom by any chance? This is a favorite color combo of mine and so hard to choose. 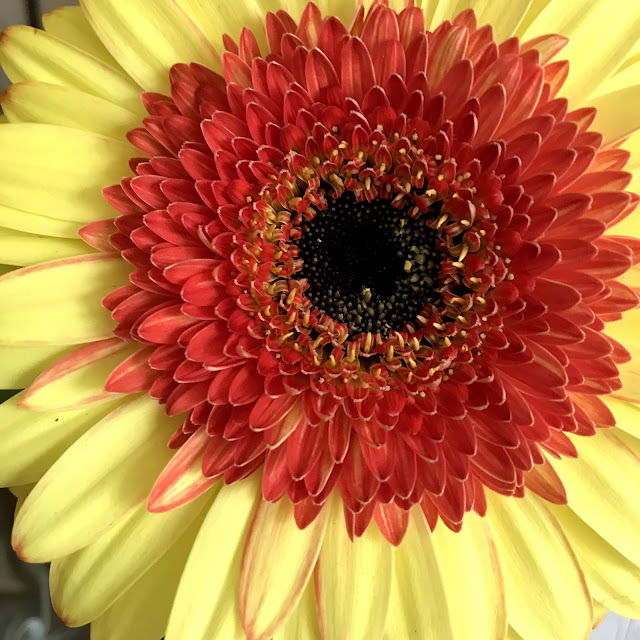 I love Dahlias on principle, but I also have an affinity for the regularity of the Gerbera flower. I think, unlike your previous commenters who have all hedged their bets, that I'm going to vote for the Gerbera. The regularity of the flower makes it an ideal pollinator landing pad, which gives it an edge, in my opinion. Yay! Thanks for playing the game Alison. I was wondering where you were taking that post title! Both are beautiful. The Gerbera is more formal society lady with a flair for color. The Dahlia is more New Bohemian with a laissez faire attitude. They both have their place but, if I had to choose just one to grace my garden, I'd go with the Dahlia. Thanks Kris, I appreciate your analysis. Yeah, Dahlia for me too...more Bohemian, exactly as Kris spells it out. Gerbera is like evening attire and Dahlia is a happy outfit that you'd wear to speed down the road in your bright red convertable in 1965. Like them both. I was already an old man by that time. It's hard, but I'm going with the Gerbera, because I love clean lines. They are both perfect for the season! There is definitely a tidiness to the Gerbera, where as the Dahlia just fell out of bed. For a single occasion, when impact is wanted, it'd be hard to beat that Gerbera. For a garden, the dahlia for sure. Ah yes...good point. The Gerbera would definitely shout in the garden. like apples and oranges, or choosing your favorite child...perhaps I suffer from multiple personality disorder? Hmmm... how many do you have hiding in there?